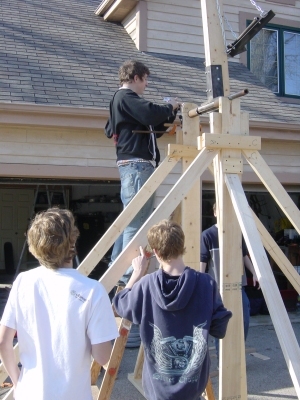 For the 2005 Medieval Faire at Mukwonago High school, my son David and some of his classmates wanted to do a trebuchet demonstration. The Medieval Faire is sponsored by the Sophomore History classes. The work was completed over two weekends. We were lucky to have nice weather for two of the days (the third was freezing rain). 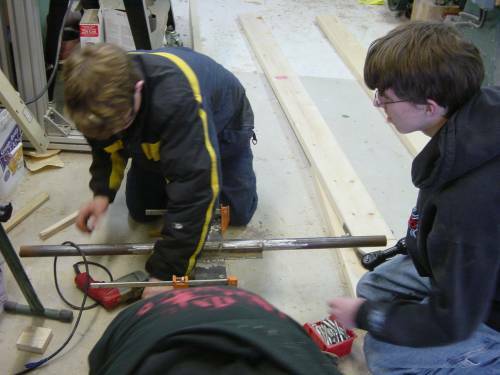 The boys did the majority (>90%) of construction including the wood and metal working (including welding). 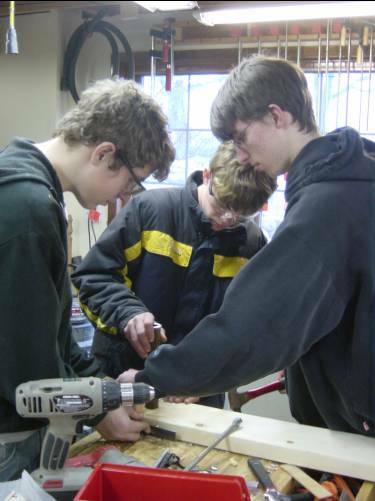 I was primarily supervising, plus I made the trigger assembly. After researching trebuchet construction on the web, David drew up a sketch of the trebuchet. The arm is a total of 12 feet long and the pivot is 8 feet high. The counterweight is a swinging design with 250lbs of weights (scavenged from home weight sets). Vertical column bearing assembly construction. Wood bearings with metal strap reinforcement. The bearings are lubricated with axle grease. Mounting the axle assembly to the arm. The forces on the axle are tremendous. The axle is made of heavy wall steel tubing and angle iron. It is fastened to the beam / throwing arm (two 2x6s) with lag screws. Initial assembly of the arm on the a frames. All of the joints are blocked and gusseted to allow for easy assembly and to prevent splitting the ends of the wood pieces. The majority the wood joints are designed to be held in compression. So far we have done over 30 firings with no structural damage. 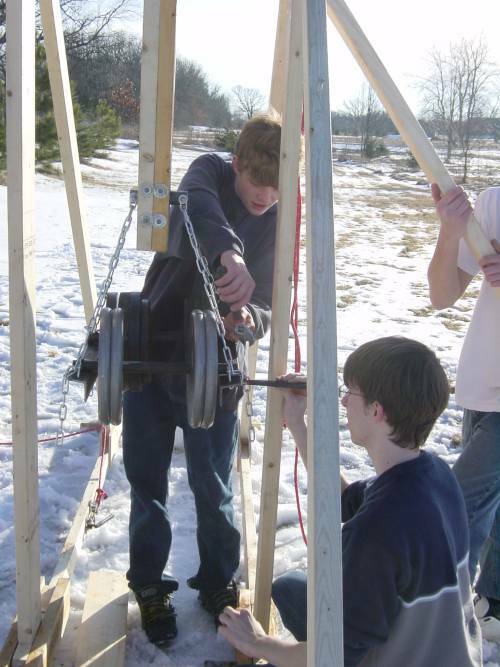 Adding the counterweights. 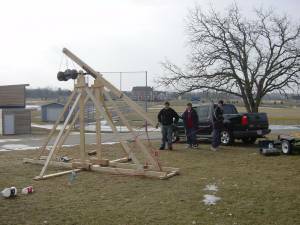 The trebuchet has now been moved to the field behind our house (away from windows and cars). It disassembled easily and everything fit back together nicely. The blocking was a huge aid in getting everything realigned. 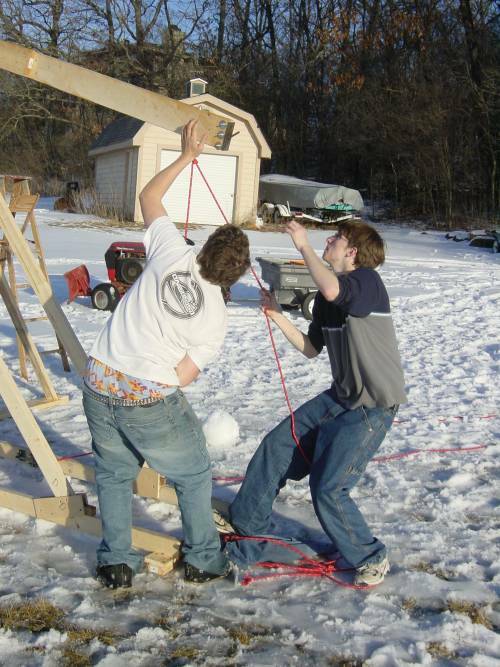 Arming the trebuchet. Hard work, pulling the arm down and holding it while the trigger is hooked up. Throwing a snowball. The snowball is approximately 12" in diameter and densely packed. The temp reached 50 degrees that day. Unfortunately it is going in the wrong direction (never stand behind a trebuchet when firing). First Launch at school. Click on the image for a higher resolution version. Note, the arm has just started to move (trigger released and sling tensioned. Movies of launches. The weather turned cold and rainy, which eliminated the use of snowballs as ammo. These are about 2MB each, so be patient. Max distance so far is 100'. These were a bit shorter (but higher). Tuning of the release point is tricky, plus the sling design should not be taken lightly. We have had the ammo go forward, backward, and nearly straight up. With later anaysis of the movies, thought and discussion, we decided that one of the major problems in accuracy was the ammunition slipping out of the sling. The problem is that both the slind (nylon webbing) and the ammo (milk or soda bottles) are slippery surfaces. A traditional leather sling and rough object would have worked out better. Making the sling deeper to hold the bottles during the initial acceleration usually resulted in th ebottle staying put in the sling until it swung around and collided with the arm. 2 liter soda bottle (4 lbs) This was done at school as one of the demonstration launches. 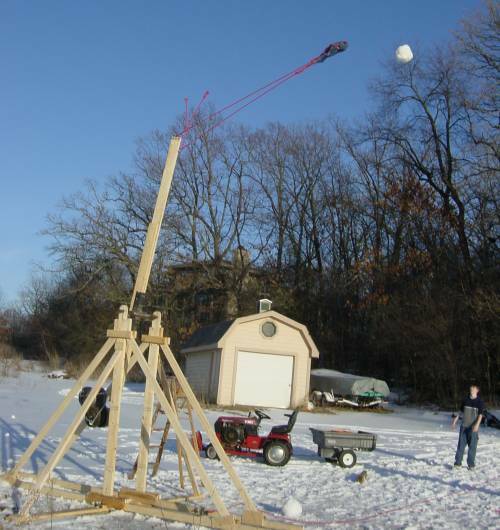 The camera work is a bit unsteady as the bottle went out of my sight vertically (est 100 ft high) and landed about 125 feet from the trebuchet.